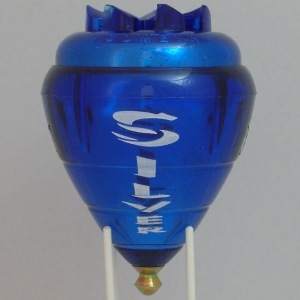 Silver is a spintop from Cometa that it has been in the market for a while. Recently I have the chance to buy it. So I bought two of them: one in blue color and the other in red color for 7 EUR each. 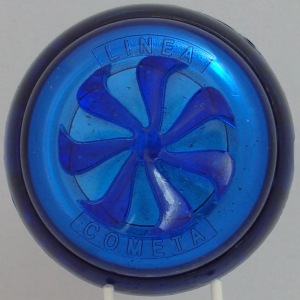 It has the typical size of the Cometa spintop: height of 73mm, diameter of 54mm and a weight of 38 grammes. It has a glossy finish (this is why is called Silver I think) and an unique crown. It is available in several colours. 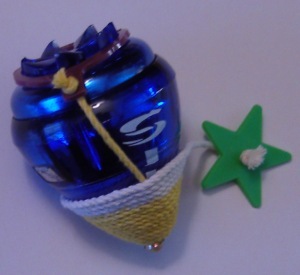 It is a nice spintop. You can play well with it. The tip is too much rounded. The edges of the crown scratch a little. It is not a problem for playing. Perhaps it can be a problem for some trickw. Don't know. Usually a smooth and rounded crown is better.